I Googled “Two Golden Words” the other day and I was pleased with the result. The words that the computer presented to me are often overlooked and much neglected in today’s often vulgar and stressed society. My parents taught me these two words and I learned early on that they had a special power locked away in them. All of you know these words and know their charm. What are they? THANK YOU! I love to hear these words so much I thought it would nice to say them as a group. So let’s all turn to someone beside you and say them together on three–Ready? But these are NOT the two Golden Words that I want to talk about today because I know two words more powerful than these. These words were also taught me by my parents and these two words forever changed my life. I also know from being around you for over a year now that all of you value these two words very highly. What are they? (You won’t be disappointed) SUNDAY SCHOOL! Now let’s all say these two golden words. Ready?—The Dream Team spent yesterday in session talking about this very thing. So this morning I will pause in my study of 1 Thess. and talk about what makes SS so unique. *It used to be that if one was on a crowded bus or subway-one would stand for elderly..
*Yes, ma’am and no’ ma’am. Walmart–“Would you like the milk in a bag?” the lady asked me. “Yes, ma’am” I replied. She stopped and smiled at me. *Writing letters or cards. Almost gone from our society. It’s all texts and emails. (I was so happy to see an old-fashioned card circulating in our Sunday School class for Edgar and Mary…) Sunday School is old fashioned. It’s an endangered species. But we don’t want to lose it. Sitting around a table with a group of friends talking and sharing and praying and reading the Bible is as old-fashioned as it gets. But it doesn’t get any better than this. There is something so fulfilling and meaningful in this old-fashioned custom. Sunday School is slow. (Good. We need that). Life is so fast paced. You can get crushed in malls today and the parking lots are crazy. And when I see fans charging into football stadiums I wonder how they sustain such frenzy for 3-4 hours. Sunday School is slow down time. No hopping about and screaming, or cheerleaders whipping up the crowd, or hotdog breaks. Just time to say hello to a friend and ask how their week went and share burdens and prayer requests. Sunday School is slow time. A lot can happen in slow time. It took God a whole day to hang a light bulb, to create light where only darkness was. He took His time. He created light after careful thought. He divided the light from the darkness and made a day and night, a morning and an evening. He positioned the stars just where He wanted them and then stepped back and moved that one over a bit and that one up a bit and then looked and said–“That is good.” It took time. He wasn’t in a hurry. Sunday School is slow time but its valuable time. 3. Sunday School is–well, its SCHOOL. (Good. We need that). Sunday school began in 1780 in Gloucester England. Robert Raikes worked with criminals and thought that a day of religious training would make a difference. SS began as schools for the poor who worked six days a week and then hung out in alleys and docks getting into trouble and swearing etc. SS also taught proper behavior, cleanliness, provided clothing for the poor and sought lift the moral standard of the kids. SS is “school” even today. All ages can learn in SS. You can learn about the world of the Bible, about ancient cultures, about how Jesus grew up and how He changed the world. SS will teach you to care about the world and how to love one another and how to be selfless and how to pray effectively and a million other valuable skills. 4. Sunday School is friendly. (Good. We need that). There’s a movement catching on all across the nation called “We Dine Together.” It started in Boca Raton Florida at the local high school. One student noticed how painful lunch time was for some kids. They sat alone. No one to talk to. No one to share the day with. *In my first year of teaching I felt the same way. About 15 teachers would meet for lunch in a teacher’s room and talk and laugh. I would go but no one knew me and so I was excluded. I got so miserable I decided to stay in my room by myself and watch Judge Judy on the television. So now at the Boca Raton high school, a club called We Dine Together fans out searching for the lonely. Then they sit beside the student and begin a conversation. And Sunday School is like this. Sunday School is a friendly place. Everyone is always welcome. But not everyone knows this. So we have to invite people and show them how friendly Sunday School can be. 5. Sunday School is memories. I don’t remember everything that happened to me as I grew up. A few things here and thee. I remember hitting my older sister once with a broom. I remember camping trips with my family. But I remember most vividly my SS times. *I remember SS at the Second Baptist Church in Jacksonville Ark when I was in the 6th grade. Sitting in little circle in a boys SS class. All of fidgeting and wanted to go out an play but the teacher holding firm spoon feeding wonderful spiritual morsels that I still chew on today. * I remember my high school youth group at the Riverview Baptist Church in Woodbridge VA. I was chosen to deliver the sermon on Youth Day. I was 15. My first sermon. My parents took me out for lunch after the service to celebrate. Conclusion: So–let’s rebuild out SS. It’s up to all of us to do this. I can’t do it by myself. But I now I probably wouldn’t be here today if I hadn’t grown up in SS. What can you do in our new SS? Be a teacher? Helper? Student? Assistant? Building an energized and meaningful Sunday school for all ages. 1. What did Sunday school mean to you when you were a kid? Any Memories? 3. What can we do to get started? Let’s list and discuss some innovations: *A monthly emphasis? This might include: Sunday lunch–special music–kids involvement–attendance goals by classes with awards in worship hour? (hat day–write a letter day–cake day–scarf day etc–(Just to have fun). 4. How can we pull in all the families with children that are already a part of the extended church family? Who are they? Make a list. SS newsletter to mail to all prospective families. 5. Selection of teachers and Training for teachers. (Order literature when ready) Have a local SS convention using resources from Bridge Network–(Lynn Hardaway and Kim Jessie). Invite other churches to join us. 7. Scholarships for families with children. Join the church and attend at least 40 times a year and the DBC will invest in your child’s future. $100 scholarships for starters. Then every 3 years that increases by $25 until the child enrolls in a college or university. Homework: Over the next month as we wait for the February meeting, pull out your Dream Team folder when you have a few quiet moments and write down your thoughts and ideas on the paper I provided. This will be our beginning point at the next meeting. *3rd meeting date and time–February 10, 2018–Panzotti’s Restaurant 10:30 am. 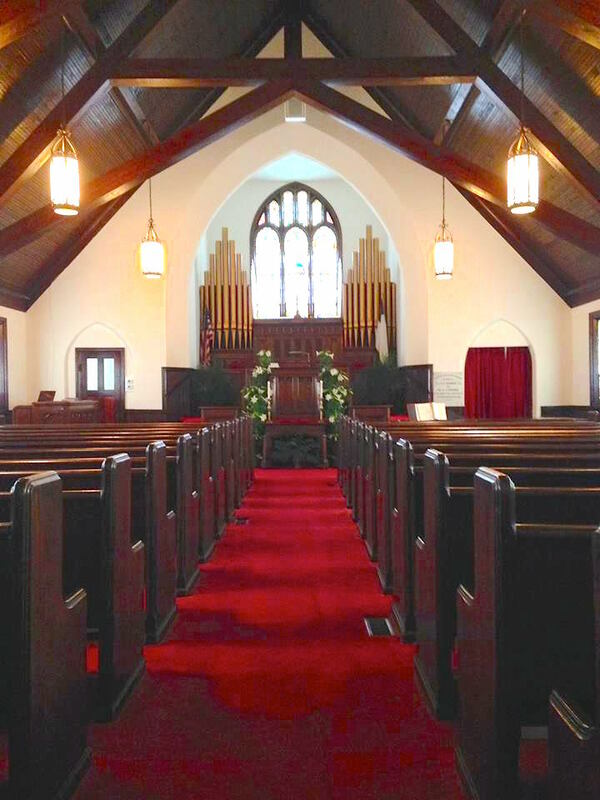 A hushed expectancy settled over the crowd of nearly a hundred as the flickering altar candles summoned last thoughts of the rapidly expiring year of the Drummondtown Baptist Church in Accomac, Virginia. Fading images of a dozen months nearly over mingled with the hallowed memories of the Christmas season as worshippers listened to the familiar Scriptures of the Christ child. The joyous tones of the pipe organ reminded all who gathered of a night long ago when a Savior was born in Bethlehem. As I looked out over the congregation this evening, I too reflected on many things. I thought of the many new friends I had made over the past year. I had quietly closed down a brief but meaningful career as a teacher in the Virginia Beach City Public Schools. 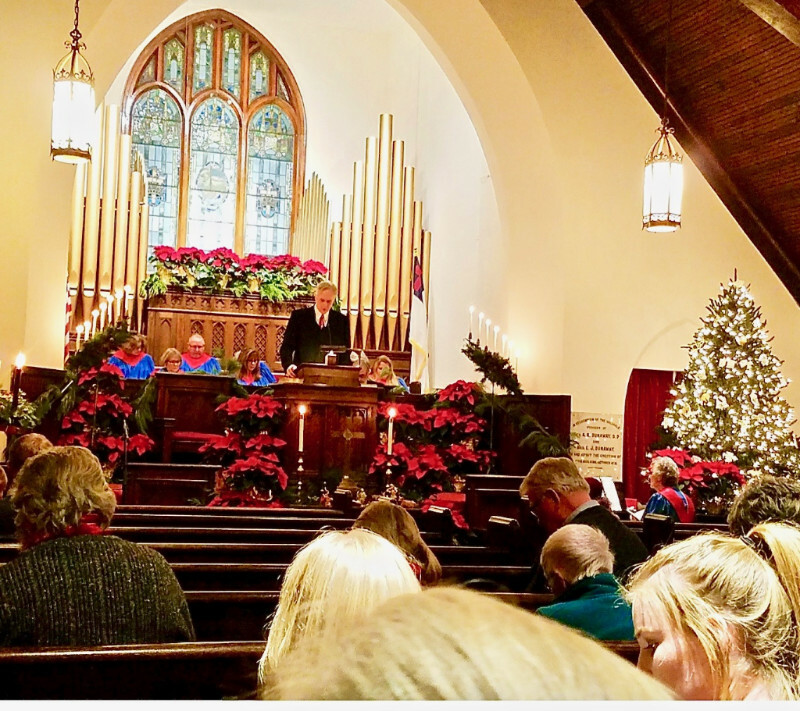 A hectic transition followed that culminated in me standing here in the pulpit looking at endless possibilities on a horizon I still did not fully comprehend. I want to thank Mr. Robert Coniglio for sharing the pulpit with me this evening, and I want to thank all my friends at the church and community for welcoming my family to the Eastern Shore. Christmas Eves are but portals to exciting days to come. Join me as we take our first steps into a promising new year. 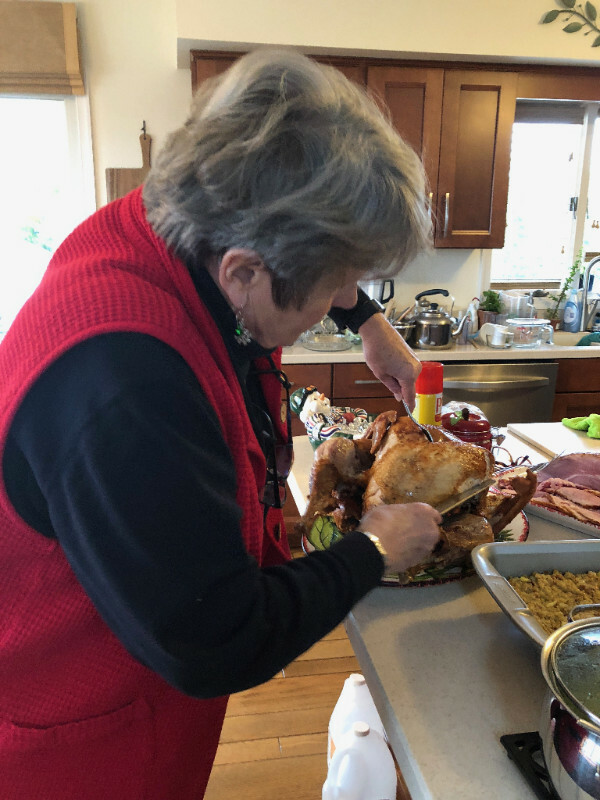 Carol Valentine carves some magic into the breast of my freshly fried turkey. She will tell you, (if you a sk her), that the whole affair was quite an adventure. Not only did we have to figure out how to use the new XL Butterball Fryer. We also had to monitor thermometers, oil temperature, extracting techniques without permanently scarring our skin etc. Quite a ride. But when it was finished, we had some mighty fine turkey! Eight layers of paradise. Count ’em. Eight. And each one a wonder. 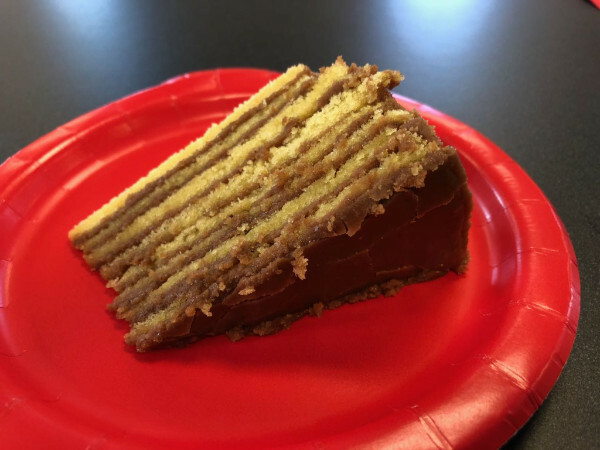 Special thanks to Alice for baking me this treasure–her very first attempt at such an Eastern Shore delicacy. And now for two of my favorite people–Leslie and H.B. Rew. They had invited Alice and me to the Wachapreague Island House for a Christmas lunch. 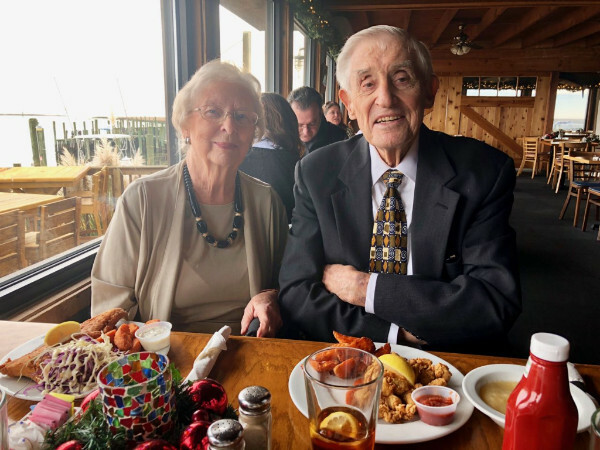 Everybody knows this is the best place for seafood and we all certainly enjoyed an assortment of flounder, oysters, sweet potato fries etc on this special occasion. Thanks for the meal and the memories on the drive home. Thousands of snow geese cascaded down from the heavens beside my house on Sea Breeze Drive a few days ago. They circled restlessly above the field and then without warning drifted down like a thousand snow leaves upon the barren farm field. They clattered and squawked endlessly, swapping stories of the flight from the tundra and then without notice lifted as one and drifted off on a jet stream to nowhere.